A record breaking goal scorer who was asked whether she could ‘twerk’ by a French DJ during the Ballon d’Or ceremony earlier this week has said she wants to be remembered for her football. Norwegian striker Ada Hegerberg was asked by the award’s ceremony co-host Martin Solveig whether she was able to perform the sexually provocative dance move. 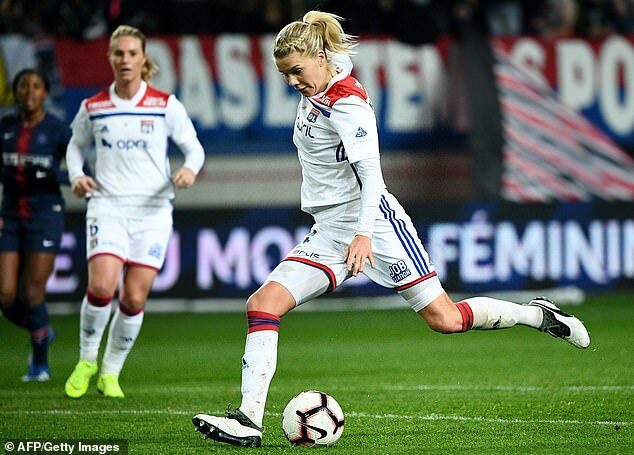 Ms Hegerberg, who was the first woman to be award in the event’s 62-year history, received widespread support for the way she handled the remark. Solveig, who is a French DJ, was forced to issue a belated apology. The 23-year-old striker, who has won the Champions League three times responded to the inappropriate request with a curt ‘no’. Later she said she ‘didn’t really consider it as sexual harassment or anything in the moment’. Former Wimbledon champion Andy Murray slammed Solveig, accusing him of being sexist and describing the remark as ‘unreal’. In an interview with The Guardian, Ms Hegerberg said she did not want the controversy to overshadow the important development of women’s football. She said: ‘It was an amazing night for women in general and women who play football. I really want to say thank you to France Football for putting it in place I know it’s 2018 and it’s been a long time coming, but at the same time it’s important to show what a big step forward for this is for women’s football. ‘It was, and is quite emotional to be honest. I try not to use the word proud too often but I was really proud, because I was in a position to promote women’s football and that’ what I’m passionate about. France World Cup winner Kylian Mbappé was at the Paris ceremony and his disgusted reaction to Solveig’s comment was caught on camera. Arsenal Ladies’ record goal scorer Jayne Ludlow said: ‘They’ll probably look back at that incident and wish it had not happened. But many people involved in women’s sport think it’s a good thing because of the response that happened immediately. ‘Top level guys at the top of their game – sportsmen, footballers – recognised that it was not acceptable and that support will grow our game more than anything else. ‘To see his (Mbappé) reaction was great, better than any promotional campaign football can have. ‘You’ve got a top-level guy saying ‘Hey, that’s out of order. You need to respect this woman because she’s a superstar’.